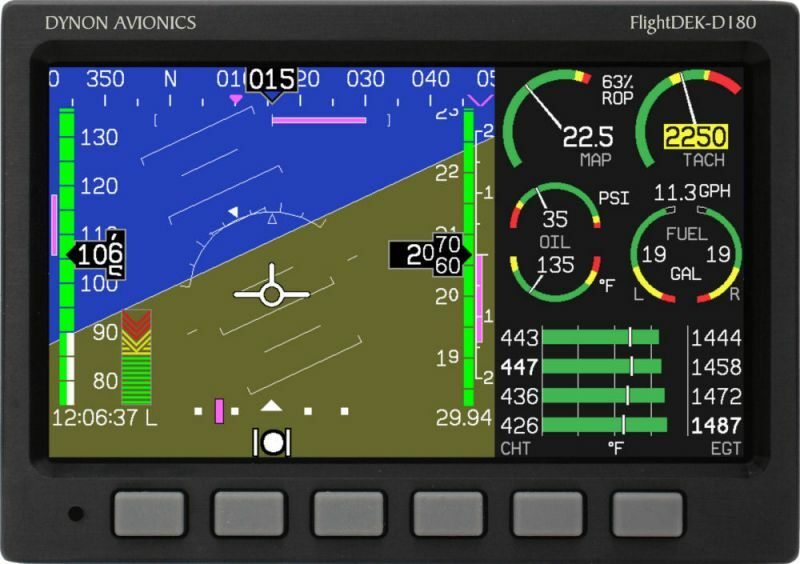 The FlightDEK-D180 represents a new class of avionics that combines all EFIS and Engine Monitoring functions into a single, very powerful instrument. This affordable glass cockpit design integrates all the features and functionality of Dynon's EFIS-D100 and EMS-D120systems. The overall result is a hi-tech, glass-cockpit instrument that is the ultimate panel space saver. Other key benefits of this design are the weight savings, simplified installation and lower overall cost. Seamless Integration: Pilots may elect to display both functions simultaneously in split-screen format or switch over to a full screen EFIS or EMS via simple hotkey commands. Six buttons arranged along the bottom of the screen provide the pilot-interface via a softkey driven menu system for easy access to in-flight functions and setting pilot preferences. Any alarms occurring in the system are immediately presented as a bright red alarm bar across the bottom of the screen independent of the page currently displayed. The alarm bar is automatically accompanied by menu selections to silence or acknowledge the alarm(s). 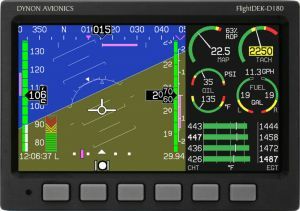 High Resolution Display: The FlightDEK-D180 features a 7” diagonal, color LCD boasting the highest resolution in its class. The stunning display features large, easy to read text and graphics all in one convenient location. A powerful processor driving the display graphics ensures real time fluid motion at all times.